The Fellowship was fortunate enough to obtain a copy of ANGEL AND FAITH #8 from Dark Horse Comics. The story is written by Christos Gage with art by Rebekah Isaacs. Joss Whedon is the executive producer of the series. 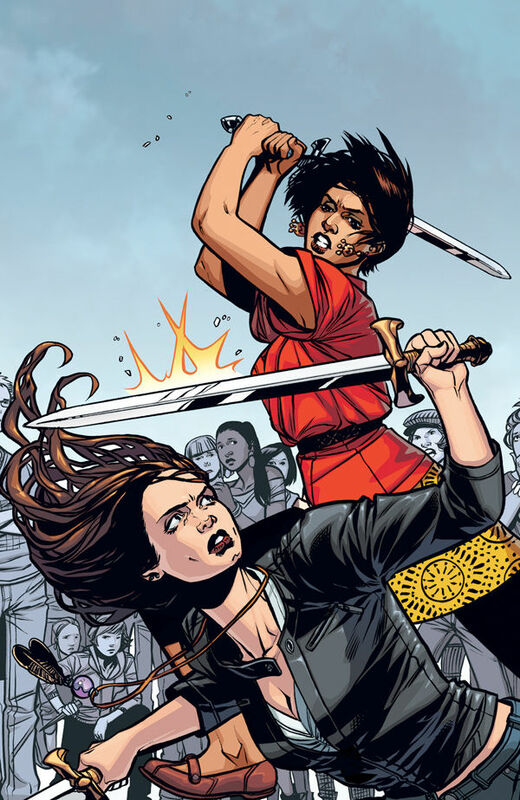 Faith has a lot to deal with is this issue as Nadira attacks her fellow slayers in anger and frustration over the loss of her sisters. Faith tries to reason with her to no avail. Upon going home, Faith and Angel find her father there adding to the problems she already has. Faith’s father owes an Irish mobster “Handsome Jimmy” Mulligan a large amount of money and he’s coming to collect. Faith’s dad asks a favor, but not for money. After resolving the issue with the mobsters and breaking ties with her father, Faith goes to Drusilla for to end the pain. Wow! It’s incredible the way Christos Gage is handling Faith. The character has really grown a lot since the end of the Buffy TV series and this issue shows it. I’m sure Faith sees her old self in Nadira which is why she is trying to help her. The interaction between Faith and her father is powerful. Angel is a bystander in this issue outside of dealing with Mulligan and his men, but even then it’s Faith that brings the confrontation to a quick end. Rebekah Isaacs’ art is so beautiful, I love it. ANGEL AND FAITH #8 is in comic book stores now or available at www.darkhorse.com.